Scones and biscuits are seriously one of my weaknesses. Fresh from the oven, I find them to be crazy-irresistable. I know that a biscuit is somehow not the same thing as a scone (if you have an explanation, I’d love to know! ), and vice versa, but they must be cousins or something because either one hits the carb-spot every time. These particular scones don’t contain any egg in the dough, but they do contain a good dose of cream along with a bit of butter. The cream makes for an ultra-tender, dream of a scone. I’ve added a bit of almond extract to the dough, as well as a sprinkling of almonds across the tops for some texture and crunch. The blueberries are there because I like almond and berries together and, because I cannot get enough berries these days. Each bite of these dreamy beauties contains the scent of sweet almond, a little nutty crunch, and a burst of juicy berries. These scones are pretty amazing on their own though, a smear of butter and blueberry jam doesn’t hurt a thing. I baked these in muffin cups, scooping the batter instead of patting it into a round and cutting out. I saw scones done this way on Donna Hay and I thought they were pretty dang cute. Frozen blueberries hold up better when mixing this dough, but if you don’t mind some blueberry streaks, go ahead and use fresh. Preheat the oven to 425˚F and place paper cupcake liners in 12-cup muffin tin. Whisk the egg with the 1 tablespoon of cream. 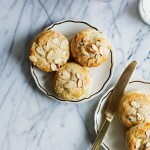 Brush the tops of the scones with the egg-cream mixture, sprinkle with almonds and sugar. 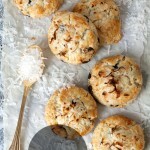 Bake in the center of the preheated oven for 13-15 minutes or until the tops of the scones are just golden. Remove from the oven and (try to) cool at least 10 minutes before serving. My understanding of scone v. biscuit was that scones have eggs and biscuits don’t–but it’s entirely possible that that’s not true and I just swallowed it because it was easy enough to remember. At the end of the day, does anybody care? A carb by any other name, right? Beautiful styling, also! I can practically smell these. That’s what I thought too, until I started making these and they don’t have an egg…conundrum! Anyway, who cares cause CARBS. Thanks, girl! I actually do think they retain a bit more moisture. Thanks, Sue! Holy heck!! These look so good! I have always just called the savory ones biscuits and the sweet ones scones, but I’m sure there’s a much more correct explanation! In any case, these look utterly wonderful. 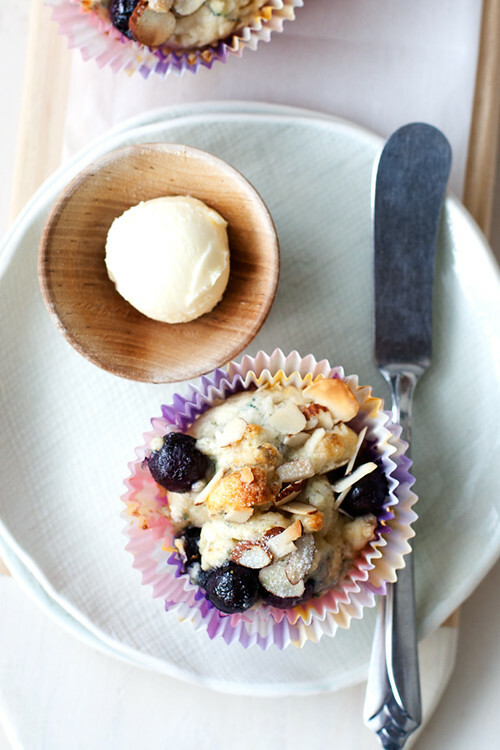 I love almonds and blueberries together – they are just the perfect combination. 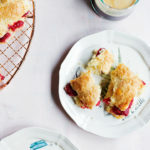 I bet you could even freeze the unbaked scones and pop them in a hot oven for a warm breakfast treat! Thanks, Averie!! Good Lord! I have a thang for biscuits.. you know this.. I’m all over these.. I love cream biscuits and scones so I know these are the bomb.com..
and for the longest I thought the word scone was just what fancy folks called biscuits. It’s confusing! But, whatevs, cause carbs! and, true fact…Utah people call fry-bread scones…that’s truly confusing. I love that you made them look like muffins! Is that clotted cream next to it? My scones need to always be accompanied by clotted cream. Because carbs. it’s butter, but I wish I could easily find clotted cream here! 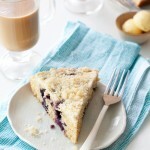 I would have scones everyday! Cindy, I am also a total sucker for biscuits/scones/muffins (basically any buttery baked good :) straight from the oven. 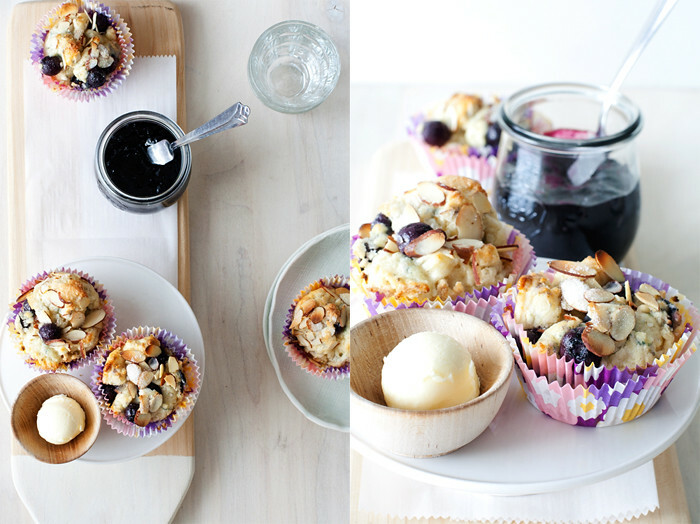 Love those juicy bursts of blueberries tucked into these lovelies! I definitely agree. Thanks, Amy! 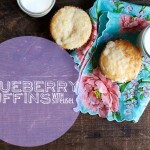 Blueberry scones/biscuits (who cares?) are my all time favourite. When the blueberries soften and turn into barely contained rivers of squidgy blueberry jam? That’s the money shot. These are my dream. YES! totally the money bits! I am honestly not a huge scone person, but blueberry anything gets me every single time. These are gorgeous!! 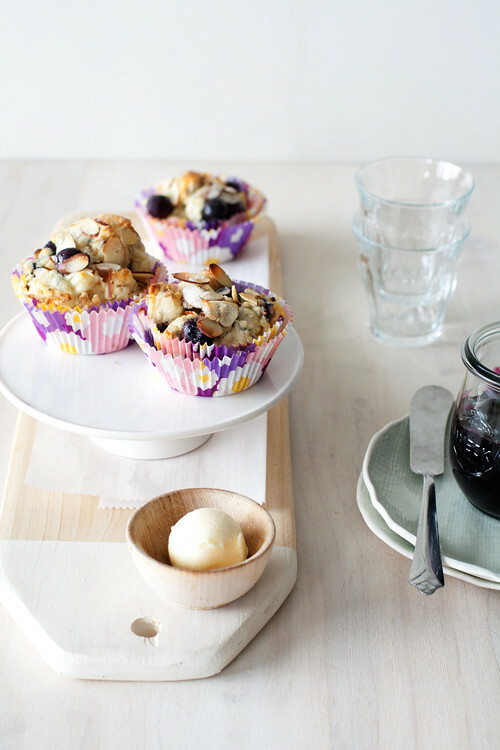 Wow these scones look like muffins! I tried one batch of scones long time back but they didn’t came out good. Going to try these soon! Those looks so big and crunchy and over the top! When I first looked at the picture though what struck me was your beautiful butter ball. I didn’t even know that could be beautiful but somehow yours is! PS love the liners :) So spring! These are so beautiful! Totally want a pan in the oven right now! could you use half n half instead of heavy cream?? I can’t really say since I never have, but you could try it. First off. I adore scones. My favourite thing to have with a cup of coffee or tea :)! These are so cute and look so delicious I’ll be trying them out in their little muffinny cups soon! The difference between a scone and a biscuit…the real truth? The difference is the origin. 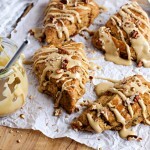 Scones originated from Scotland, and biscuits to have with meals in America. Generally speaking scones do have an egg somewhere in there..if not..then you have simply just spruced up a biscuit! Many times scones have an eggwash …that’s all. Which you have incorporated! I’ll stop now…thanks for the delicious recipe! I baked these over Easter, they were a hit! So good! I am so happy to hear that, Marcella! Thanks! !